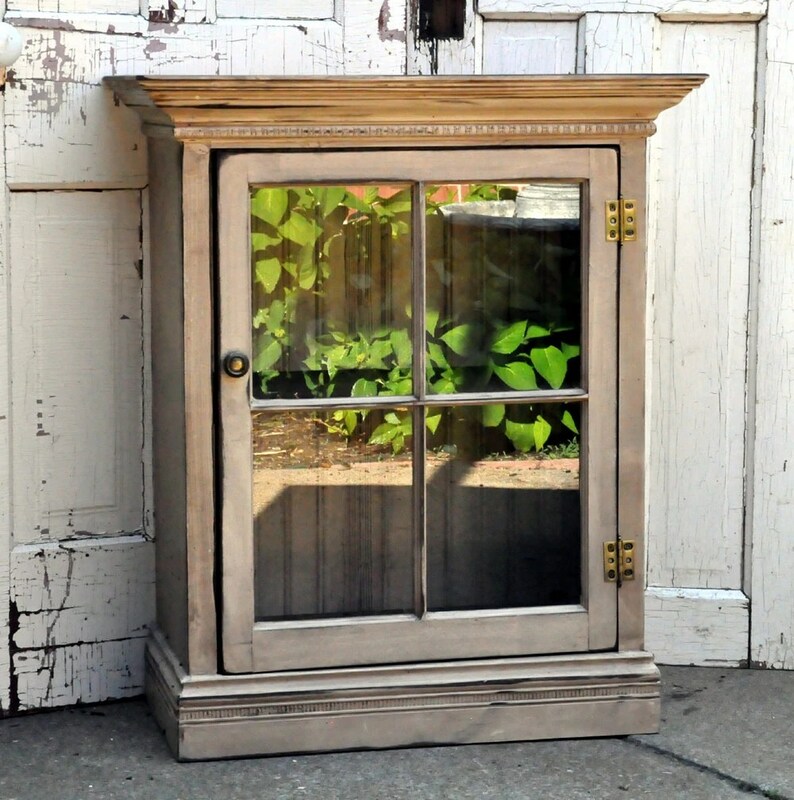 So what can you do if a cabinet you love has a door with a broken piece of glass? Or what happens if you find a piece of furniture you love but the glass is not up to par? I ran into this problem when moving a few years ago. I had an oak cabinet that had glass doors and was a cute storage piece but while moving, the glass in one of the doors shattered. So my fix and a fun one at that was to break the glass on the other door (to match) so that all of the glass was safely removed. Next, I painted my piece of furniture and chose to add fabric to the leftover window areas. Adding fabric is very easy. I chose a printed piece of fabric so that it would compliment the all-over color I had just added by repainting and simply staple-gunned it to the inside of the doors! It is so easy and really looks great. Just make sure you pull the fabric very tight and secure it well. Here I am showing you some images of what other etsyians have made. As you can see, some are using wire mesh in lieu of my fabric idea which is also a nice option. The possibilities for this project are endless because you could choose a piece of furniture that has really ornate glass-work, or you could even use this project for kitchen cabinets. Honestly, I think it has a lot of potential and is a welcomed alternative to glass. Below is a photo of how my simple cabinet for storage turned out! One last thing, I will mention that if you want to use it for electronics, be sure to choose fabric transparent enough that your controllers work through it.